We are constantly adding new exciting sounds to our online sound effects library, but this week we've added something a little bit out of the ordinary, so we wanted to give it a mention in our blog. Bugs! is the name of a new library created by the creators of Blastwave Sound effects, and this library contains 700 sounds of insects; including ants, termites, bees and bumble bees, flies and mosquitos, ant colonies, dragonflies, worms and maggots, and more. As you can imagine, recording and producing these sounds is a challenge. Have you ever tried to get a fly to do as you say and buzz around the microphone for a few seconds, so you can get a good recording? It goes without saying that a lot of patience and ingenuity is involved as far as the sound recording engineer goes. Following a fly or a bumblebee around with a microphone for 2 hours to get a good 5 second sound effect can be expected. Trust me, I speak from personal experience. Recording sounds of ants, termites, worms and other "almost completely quiet" animals can also be a challenge. Again, it's no good simply holding a microphone up in front of an ant walking across the ground. It simply doesn't produce enough sound for the microphone to even pick it up. 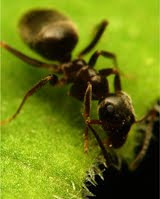 So again, some unusual techniques have to be employed, such as placing a miniature microphone IN an ant colony or right up against the side of a beehive. These sounds were difficult to capture, and we feel that they are quite unique. All insect sounds from the Bugs! are now available for immediate download in High Definition 24-bit audio WAV files (which can be downgraded to normal CD quality). We hope you'll find these sounds useful for a multitude of different types of projects, including film / theater productions, video games, sound montages, sound editing projects, Windows / Mac sound schemes and much more. Enjoy! To see the whole Bugs! sound library and listen to the sounds in it, please follow this link to The Bugs! Sound Library.